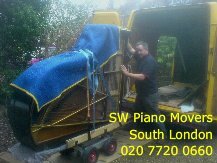 SW Piano Movers have years of experience moving baby grand pianos,and boudoir, parlour, or grand pianos up to 6ft 6" in length. We also move upright pianos and organs both locally and across the UK. Call us on 020 7720 0660 to discuss the details, timings and cost of your move. Whenever possible, the arrangements will be confirmed by email. 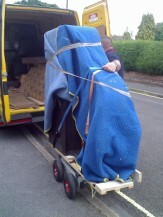 SW Piano Movers are based in Upper Norwood, South London. 1) Piano shoes and skids. These are items of equipment necessary for moving grand pianos, which have to be turned on to their side. 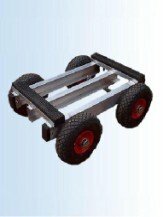 2) Piano trolley with good sized wheels. Their main use is for storing a piano on the van to prevent other items damaging it. When actually manoeuvring a piano, heavy quilting can be a hindrance, since grip and vision may be impaired. 4) Boards, ramps, blocks and chocks for steps. 5) Blankets and plastic sheet, and cardboard for wrapping panels, protecting floors and manoeuvring pianos. 6) Movers Ties and heavy duty ratchet straps: Take care to exert only minimum pressure with the ratchet. It is the thickness and strength of the strap which is important so you can hold it well and trust it. 7) Screwdrivers, soft faced mallet, socket sets and pliers. The lyre, legs, key cover, desk and lid (and hinges) are all removed and wrapped prior to moving. Our best advice regarding musical instruments insurance.